If I was to ask you what a Carbonara is, you would probably describe it as a pasta dish with cream. Many people would agree that you’d be right, as this what you would typically find on menus and in frozen pasta meals today. But don’t mention this to an Italian Nona, as you will most likely get a smack to the side of the head for suggesting the idea of adding cream to this classic Roman dish. 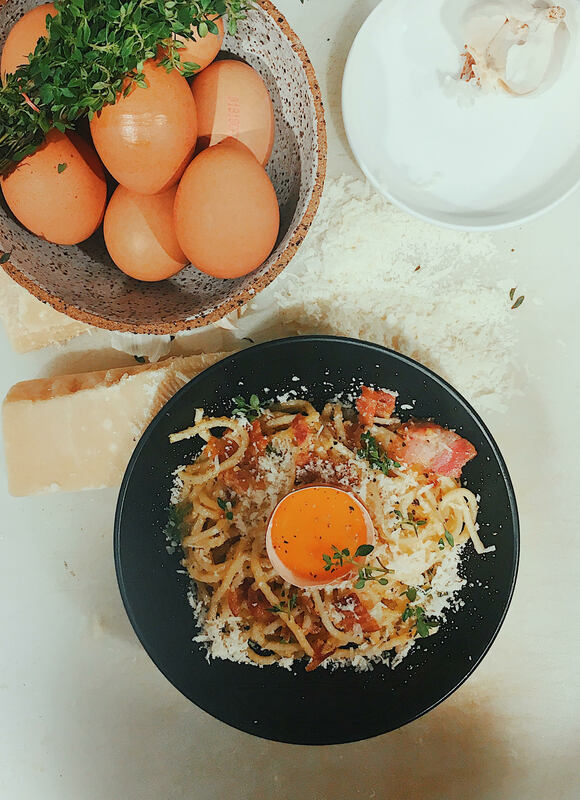 On my first trip to Italy, is where I had my first taste of this OG recipe and was left wondering after polishing off a whole bowl of that delicious Carbonara – How is it that it was so creamy but there was no cream in sight? The answer – the egg! 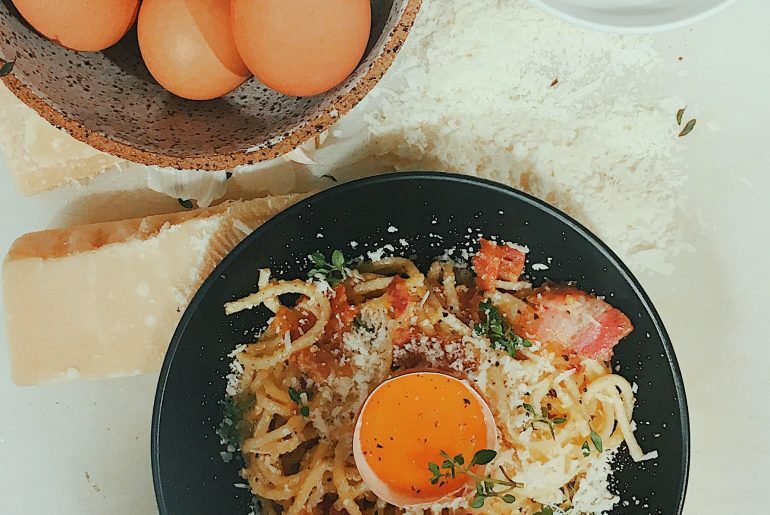 Gently warming the eggs and parmesan cheese by tossing through the pasta creates a delicious glossy and creamy texture. The end product is thick and smooth, and absolutely delicious. It’s always better to know what’s going into your body and even better when you learn how to make it yourself! So gents here’s my recipe for this humble dish to add to your repertoire! With only a few simple ingredients you probably already have in your cupboard, It’s a quick and easy dish any beginner can attempt and sure-fire way to impress your missus, special friend or mates! My twist, is garnishing the dish with some sprigs of fresh lemon thyme – it’s a little surprise of herbaceous citrius-sy freshness that you don’t expect! And if you feel like spicing things up, drizzle some chilli oil on top! To finish the dish, I also add an extra egg yolk in half an eggshell on top to mix in! This might freak some people out “raw egg yolk” but trust me it definitely adds that extra richness and even more creaminess, plus it also looks good for the gram! Give the recipe a go and let me know what you think! 1. Separate 2 egg yolks into a bowl, finely grate in the Parmesan, season with pepper, then mix well with a fork and put to one side. 4. 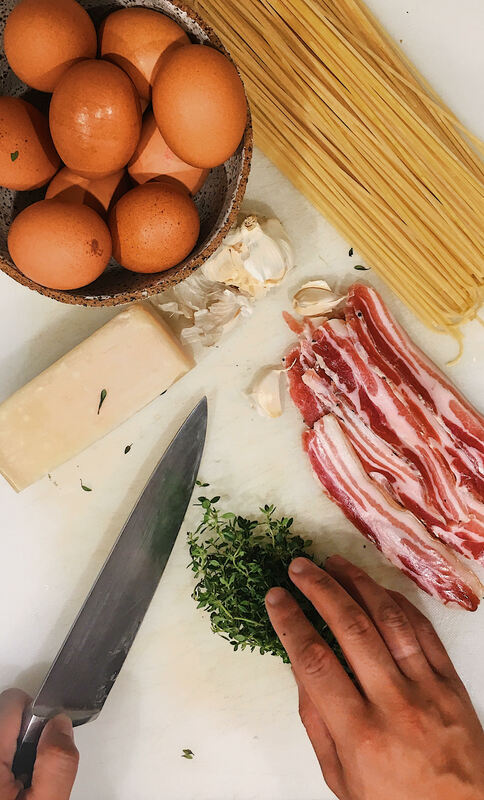 In a medium frying pan, if use the skin of the pancetta/speck and rub it over all the pan (this will add that delicious bacon flavour to your dish, if not use oil), then place over a medium-high heat. 5. Roughly crush with the palm of your hand, add it to the pan and leave it to flavour the fat for 1 minute. Stir in the pancetta/speck, then cook until it starts to crisp up. 6. Remove and discard the garlic from the pan, then, reserving some of the cooking water, drain and add the spaghetti. Toss well over the heat so it really soaks up all that lovely flavour, then remove the pan from the heat. 7. Pour in the egg mixture – the pan will help to cook the egg gently, rather than scrambling it. Toss well, adding more cooking water until it’s nice and glossy. 9. Option: Add another separated egg yolk inside half an eggshell on top to mix in! • Reserve your egg whites for an egg white omelette for breakfast!